Over the past 10-plus years, the García family has quickly risen to an elite status among manufacturers in the world of premium cigars. Through their famed My Father Cigars factory in Estelí, Nicaragua, the García’s produce some of the most sought-after cigars in the world; including a host of blends for their own My Father Cigars brand. The García family’s status was solidified in 2012 when their Flor de las Antillas cigar earned the prestigious honor of Cigar Aficionado’s #1 Cigar of the Year. The cigar paid homage to the family’s roots in Cuba - which (Cuba) is known as the largest of the Antilles (or Antillas) Islands. My Father then followed up this award-winning blend with a special maduro variety in 2015, released as a limited edition, shop-exclusive cigar. But in 2016 it was announced that the blend would go full scale, launching 5 box-pressed sizes across the country. Introducing Flor de las Antillas Maduro, a new, darker take on the beloved Antillas blend. 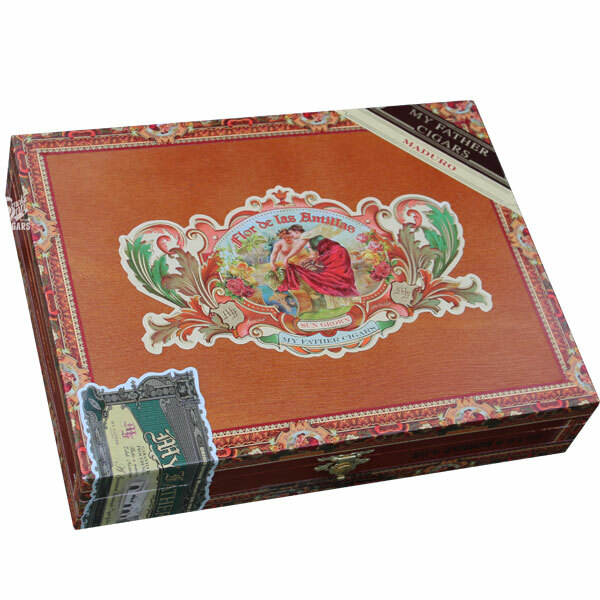 Flor de las Antillas Maduro uses a very similar makeup as the original, incorporating 100% Nicaraguan tobaccos in the cigar's filler, as well as a unique double binder. But the golden, Sun-Grown wrapper from the original has been replaced with a rich, Ecuadorian Habano Sun-Grown Oscuro leaf - making for a completely new experience that is perfect for the maduro fanatic! Get your hands on this special, once-limited blend - now available to the masses!